The only difference between a thrift store and an antique store is an antique store specializes in only the old & is usually more expensive. There are plenty of antique treasures to be found in regular every day thrift stores. My favorite antique collectables include doorknobs, books, cameras & kitchenware. Brand new they're upwards of $15 a piece. In a thrift store, $3 tops. It's worth taking a peak. Consignment stores will usually have a higher price tag but will have better quality merchandise. This is because the store owners have the choice of denying or selling the merchandise brought in. Rather than donating items, people are getting paid for their items and only a portion of it goes to the store. This is where you label-junkies can find a designer bag or jeans at a fraction of the price without having to dig through racks at Goodwill. Those pristine Gap jeans in your size are not going to come calling out for you. You're going to have to get in there & hunt them down. And don't be afraid to move stuff around on the shelves. They're not always organized the best with everything in view. A bit morbid, but an estate sale is when someone must liquidate the majority of their assets either after death or financial loss. But don't feel bad about it, those items need new owners & you can usually find some great treasures in there. They are mostly advertised in the paper with garage sales or they are absorbed by a local thrift store. Thrift stores are great for furniture. The price difference in new and used furniture, especially solid wood, is usually the most substantial in all thrifted items. It will probably require some TLC, but even if you don't think you have the handy skills to refurnish a chair or a dresser, take a risk. You might surprise yourself. A can of spray paint can work wonders. Then you have a finished product that is literally one of a kind. Before you turn your nose up at the idea of buying someone a used gift, truly think about the person you are buying for. If you really know that person, you can find something that says to them, I found this just for YOU. Does Grandma need another pair of fuzzy slippers or an antique tea set with her favorite flowers on it? Dont' be obnoxious about it, but don't be afraid to point out something that you think should lower the price a bit. Most times, they are willing to come down on the price to make room for more merchandise. Use it. You can turn a Goodwill into a Michael's just by getting creative. Frames, fabric, candle sticks, flower pots. Many craft ideas in there. 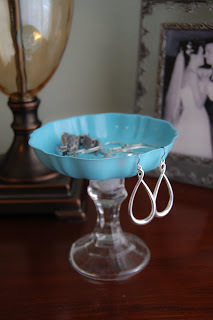 Small dish + candlestick + spray paint & gorilla glue. Totally her idea. Cute, right! There is a fine line between treasure & junk. I have made this mistake one too many times. If it will take more than a minor repair to fix, don't bother with it. A 3 legged chair will do you no good. I'm sure you're aware of all of the kids' consignment shops out there. Once upon a Child & Other Mothers to name a few. There is a huge market for used children's clothes & toys because they are used for such a short amount of time that they don't show wear and therefore, can be re-sold for a profit. I don't even buy baby gear or clothes new anymore. Just be sure to check recalls when buying furniture and toys. Know what you're shopping for and make a list of things you need/want before you go in. Those over-stocked shelves can be overwhelming. If you know you need curtain rods & a brown belt, you will be able to scope them out that much faster. It's a good idea to always carry cash. Many thrift stores are non-profit and cannot afford to run your Mastercard for $3 when it costs them a fee every time. Also, it gives your spending a budget. There is no shame in shopping second-hand. When someone compliments me on a thrift store purchase, I say it loud & clear with pride. "Oh yeah, those are Pier One curtains I got at Goodwill for 5 bucks!" Don't write everything off at first glance. There can be some real potential in there. You just have to open your mind to the possibilities. I am truly the worst about this, but thrift stores are project starters for me. It can be a good thing if you actually finish your projects because not only do you have a great finished project but also a fun hobby. However, if you collect un-finished projects, don't be tempted to pick up another one. Be quick & quiet. This one was inspired by Ballistic Gypsy and I have seen her do this. If she sees a worker put a valuable item on the shelf, she will creep in there all stealth like and nab it before anyone else sees it. I have even received a phone call like it was black market trading telling me someone rich must have dumped their closet at GW and to hurry in there to nab it up. I'm pretty sure she whispered too. There are almost always sales going on, usually tag sales when a certain color tag is 1/2 off that day. Consignment shops need to rotate their racks constantly so they will usually have their sales at the end of the month. Look for signs or ask the cashier. Also, watch for bag sale flyers. When they really need to purge their unsellables, they will have one day when they charge one small price for everything you can fit into a bag. I like these to collect fabric, zippers & buttons. T- Take a friend whenever possible. They can be good for a 2nd opinion or to keep an extra eye out for something you're looking for. Notice I said friend...not husband. Big difference. Also, they can super fun! Well obviously, everything we're talking about is used, but I have found that there are just some things I refuse to by new anymore. For example, curtain rods, baby shoes, frames, wall decor, baskets, books, and the list goes on. These are all items that usually don't show wear after being used, and therefore are just as good used as new. At a fraction of the cost! V - Vintage is in. W - Wash it before you use it. Always have a can of Lysol handy in the garage so you can spray down before you bring it in. Especially if you're buying something that can potentially foster bed bugs or lice. With that said, go ahead and make friends with your washer's HOT cycle. X - eXamine the store first. I like to scan the store once over then go back & start digging. This way I can decide which section looks promising & go after it first. Chances are you won't have time to dig through absolutely everything, especially if you have kids in tow. My favorite Saturday morning routine. You can usually find a listing in the local paper or on Craigslist. I love yard sales because the merch is priced to sell and you have less competition. Z - Zippers? Zoos? Zebras? really...not much I could come up with here, but you get the point. Well, that was my list. 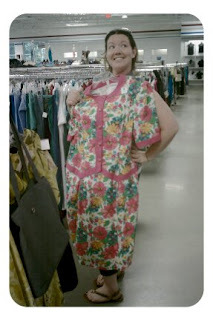 All in all, thrifting can be a lot of fun. It's great for the wallet, the environment and the imagination. I hope this has given you wannabe-thrifters the inspiration you needed. Let go of your fear and go treasure hunting! You never know what you'll fall in love with next! LOVE this post, friend! FAB tips. I just wrote about this post on my blog! This is great. I'm kind of horrible at thrifting.